They compare their case to that of the 1772 court battle concerning an American Slave, James Somerset, who had been taken to London by his owner, escaped, was recaptured and was being held in chains on a ship that was about to set sail for the slave markets of Jamaica. With help from a group of abolitionist attorneys, Somerset’s godparents filed a writ of habeas corpus on Somerset’s behalf in order to challenge Somerset’s classification as a legal thing, and the case went before the Chief Justice of the Court of King’s Bench, Lord Mansfield. In what became one of the most important trials in Anglo-American history, Lord Mansfield ruled that Somerset was not a piece of property, but instead a legal person, and he set him free. NRP maintain that they have a strong scientifically based case. While our legal petitions and memoranda, along with affidavits from some of the world’s most respected scientists, lay out a clear case as to why these cognitively complex, autonomous beings have the basic legal right to not be imprisoned, we cannot, of course, predict how each of the judges in the three county courts will respond. Habeas corpus cases are usually heard soon after being filed since the person is being held captive. So it’s possible that the judges in any or all of these cases could move quickly to a hearing – or to deny the petition altogether. On the other hand, considering that this is new legal territory, they could slow the proceedings down. And each judge could rule in a different way. Whatever happens in the trial court, however, New York allows for an automatic appeal of an adverse habeas corpus decision. And either side can appeal the ruling. NRP predicts that their case will be heard, sooner or later, by New York’s intermediate appellate court, and quite possibly by New York’s highest court, the State Court of Appeals. And, from many points of view, that’s where we would like the case to be heard, since what happens at the appellate level has much wider reach than at the trial level. This is a notoriously difficult area of jurisprudence, largely because once one crosses the human/chimpanzee species line (and why not? 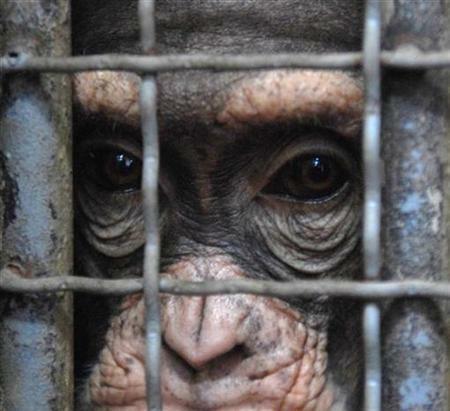 they share over 98% of their DNA with homo sapiens, and only the religious believe there is any bright line between us and the rest of the non human animal world) then we arrive straight at the door of the laboratory, where research on apes and monkeys set their “rights” and those of humans in a starkly opposing trajectory. But it is difficult – other than nakedly selfish grounds – to deny the higher vertebrates the bedrock of what we claim we humans have as an entitlement to rights: autonomy. Behavioural research on the great apes and the cetaceans (whales and dolphins) have long established that these animals have a capacity for conscious experience like humans. Furthermore experiments have shown that they show signs of having desire, being able to act on that desire to plan future and make choices accordingly. This is the behaviour of an organism that has autonomy. Bizarre though it seems to modern opinion, in many ways this leap of understanding in the nature of the slave, from mere chattel into full member of the species (and therefore no longer property, being necessarily free), required a larger job of persuasion than any equivalent effort today to convince the public of the entitlement of at least certain animals to a limited range of rights. There are of course plenty of people who think, in a post-religious society, that there can be no such thing as ‘human rights’ since there are no foundations outside language capable of underpinning the kind of universal ethical judgement inherent in use of the term. Not surprisingly, says Gearty, this is not good enough for people who think of themselves as human rights scholars. This particular language of human rights is being used to describe a thread of behaviour that is natural and, from the point of view of the flourishing of the species, valuable. And there is no reason why animals – or at least those of the “higher” vertebrates whose behaviour we have observed exhibiting consciousness of others and future planning etc – should de excluded from this model. Certainly Gearty has the force of modern biology behind him. Evolutionary psychologist Stephen Pinker in his weighty exploration of the decline of violence The Better Angels of Our Nature (Allen Lane, 2011) describes the widening “moral circle: we have used the language of human rights to expand its net of solicitude ever outwards towards categories of humans (women; slaves; prisoners-of-war; also children, prisoners, those with mental and physical disabilities and many others) previously invisible to the powerful: there is no reason in principle why this outward momentum should be permanently blocked at a species barrier that is after all only a human construct. The crux of our cases depends on judges reading and thinking about what’s presented before them. I don’t think that’s happened yet. And that’s what we’re hoping from the appellate court. We will be very disappointed if appellate court judges have not read and absorbed that. They’re our main targets. Pet shock collar ban: barking, or a new era for rights? I like Peter Singer’s concept of equality: the right to an equal consideration of one’s interests (http://www.utilitarianism.net/singer/by/1979—-.htm). Since certain non-human animals have fundamental interests in avoiding pain and fulfilling certain desires, it seems obvious that they should have certain legal rights. Let me guess – these ‘human rights’ come with a ‘Responsibility To Protect’ (R2P)? Seriously, the way to prevent poaching is as simple as it is politically unacceptable – pay the people whose land it is a living wage for the rest of their lives. The same as if they would still have access to the land, which they often return to, to farm and hunt the way they used to. Of course, you would see African people end up with money, and we all know how that plays with the scions of empire who run these giant animal rights corporations.